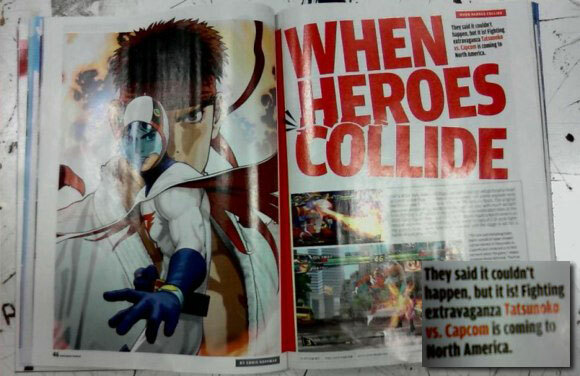 Tatsunoko Vs. Capcom Coming to US, Says Nintendo Power - Nintendo Life: Wii: "Latest issue of Nintendo Power spills the beans on Capcom's elusive fighter. U.S. fighting fans and non-Japanese speakers, rejoice, as the Japan-exclusive Capcom fighter Tatsunoko vs. Capcom may grace your non-modded console yet! A scan from the latest issue of Nintendo Power via Kotaku via a NeoGAF poster reveals that the game is indeed breaking out of the motherland. Presumably the game will keep it's name, as the article uses it, despite Tatsunoko's characters having been in bed with over a dozen companies in America. An official-official announcement is expected for E3, which leads us to believe this was indeed one the two secret games Capcom is set to unveil.